The creatives at sweetgrass productions have teased audiences with a 3-minute short of their feature film ‘afterglow’, stunning viewers into silence with its athletic feats, dazzling interplay of light and color, and cinematic skill. what did it take to capture some of the world’s best skiers on an illuminated nighttime ride through the extreme heights of the frosty wilderness? ‘deep pillows and alaskan spines, all filmed at night, with massive lights, custom made LED suits, and a national governments worth of logistics, planning, and civil engineering’, the filmmakers describe. ‘I can’t even begin to explain how difficult the whole thing was,’ film co-director nick waggoner said to wired in an exclusive feature, ‘we wanted to do whatever we could to push the visual envelope’. Filmed as a partnership between sweetgrass productions, philips TV and swedish agency ahlstrand & wållgren, the film represents a creative endeavor that also celebrates branded content: the unique partnership highlights a never-before-seen vision of skiing, with the color and light technology behind the philips ambilight TV. 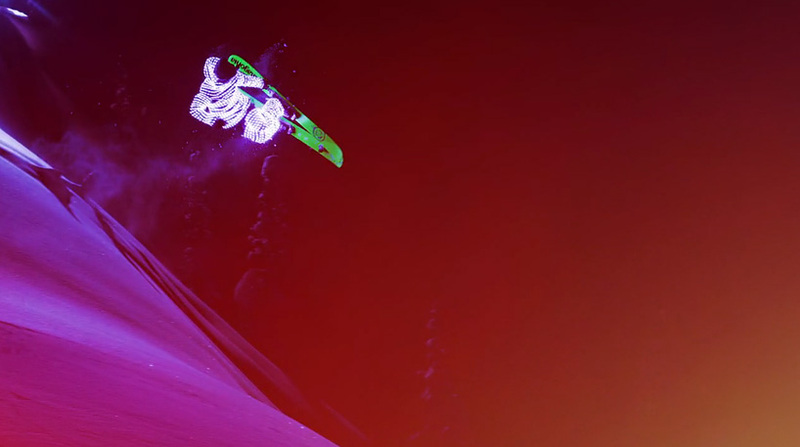 7,000 LEDs have been individually sewn onto each skiers’ gear,skiers pep fujas, eric hjorleifson, daron rahlves, and chris benchetler feature within the film,backcountry skiing has been filmed at night and in ultra high definition.